Arambol: A beach popular with holidaymakers, still retaining its hippy soul. It has a large number of cafes and offers basic accommodation. It can be fun at night when cafes light bonfires and throw parties. 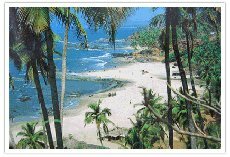 Vagator: is an attractive little bay between rocky headlands with a small series of small beaches particularly attractive in the early morning, though the sea is not always safe for swimming. In the rocks by the waters there is an extraordinary carving of what appears to be Buddha. Beach side bamboo huts serve crispy prawn noodles, melon lassi and freshly grilled fish. Anjuna: Once a hippy hang out, it is now enjoying a makeover and is one of the most beautiful beaches in Goa with its white sands and blue sea. Apart from Wednesdays when there is a weekly flea market, there is a feel of calm & timelessness. Long walks along the beach under the shining moon will soothe you beyond imagination and watching the sun going down is every visitors favorite pastime. 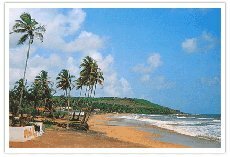 Baga & Calangute: It was hippies who first discovered Calangute in late 1960`s and there on spread word about the beach. 1970`s saw tourists from Europe coming in large numbers. Now it is peppered with two & three star hotels, bars, discos and English pubs and American pizza joints. Aguada Beach: Offers miles and miles of powdery golden sand, striking vista of blue marine waters and historical Aguada fort that tells mysterious tales of its past and splendid churches. 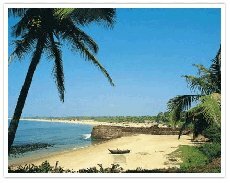 Located 4km from Sinquerim beach buses from Panaji can drop you somewhere close to Aguada beach. There are some magnificent churches that astonish the tourists with their tranquil and heavenly atmosphere. Aguada beach has cafes, roaming vendors of everything from Kashmiri carpets to massages, and a good range of water sports. Candolim Beach: A much needed reprieve from the beaches that spill over with people, here it is not difficult for you to find a spot where you can lay down and relax. The sandy stretch of the Candolim Beach runs into the Calangute Beach. 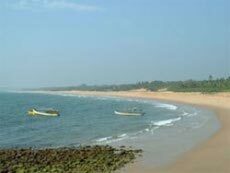 Candolim beach is a long stretch of uninterrupted beach that has the scrub-covered dunes as its backdrop. There are umpteen opportunities for you to indulge in a variety of water sports, right from parasailing to water skiing. 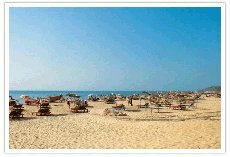 Another major attraction of the Candolim Beach is the boating excursions that allow you to enjoy sight of the smoldering sun dipping into the sea. 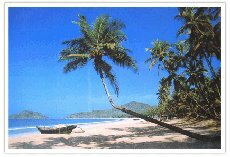 Palolem: Facing a blue bay between two headlands is Palolem 70 kilometers away from Goan capital Panjim. A crescent shaped bay, white sand peacefully merging into the sea, swaying coconut palms - Palolem is picture perfect. It has little wooded islands to the north. Getting busier each season, a large number of temporary bamboo huts dot the beach as no permanent structures are allowed for 200m from the beach. Karwar is just one of the secluded beaches dotted along Karnataka`s 320 km long coastline. It has all the makings of a perfect holiday with gentle waves, palm-laced beaches, silver sand, and calm, peaceful coves. Karwar lies on a thin strip of tropical sand that is bound by the Western Ghats on its eastern side and embraced by the Arabian Sea on the west. The sea is dotted with several small islands on the horizon. Amongst them, about 3 kms away, is Devbagh, a centre for diving and snorkelling. This beach is said to have inspired Rabindranath Tagore to write his first play. It will surely inspire you to surrender to the timeless rhythm of the sea.